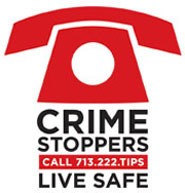 Crime Stoppers and the Houston Police Department’s Robbery Division need the public's assistance identifying the suspect responsible for an aggravated robbery with a deadly weapon. On Monday, December 4, 2017, the complainant arrived with her three young children at the Snowflake Donuts, located at 7010 Woodridge Drive, in Houston, Texas. The complainant opened the driver door to her vehicle and unknown Hispanic male approached her and pointed a small pistol at her and demanded her purse and keys. The suspect then made the complainant move to the front passenger seat and got into the driver seat. The suspect drove the vehicle (with the complainants inside) out of the parking lot and told her to remove her jewelry as he was driving. The suspect was driving recklessly and lost control of the vehicle, causing it to run through a fence and striking a residence at the 7600 block of Hemlock St, disabling the vehicle. The owner of the residence attempted to follow the suspect on foot, at which time the suspect shot at that complainant. Surveillance cameras captured the suspect exiting a vehicle after the carjacking (from an civilian unaware that the male had just committed a crime) and while walking along the street after crashing the vehicle. Suspect description: Hispanic male, 26 to 34 years old, 5’07 to 5’08, 180 to 200 pounds, blue and white striped polo, black shoes and black cap.